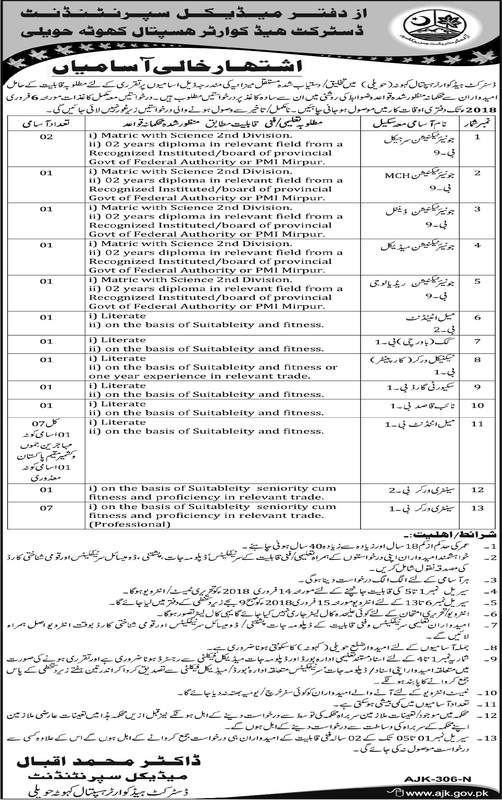 Government of Azad Jammu and Kashmir (AJK) has announced Latest Government Jobs 23rd January 2018 in District Head Quarter Hospital Kahuta Haweli. Interested Candidates can apply for these New Government Jobs. Jobs categories are as follows, Junior Technician Surgical, Junior Technician Dental, Junior Technician Medical, Junior Technician Radiology, Male Attendant, Cook, Technical Worker, Security Guard, Naib Qasid, Sanitary Worker.